Scalefusion (formerly MobiLock Pro) is a cloud based mobile device management solution which enables users to control their company’s Android devices. The system locks devices into kiosk mode, replacing the standard device home screen with a customizable display that limits which apps and websites can be accessed by device users. Android OS settings can also be made inaccessible, preventing employees from changing device settings or installing unapproved and non-essential apps. Individual websites can also be blocked or whitelisted, and the browser address bar hidden to prevent navigation to unauthorized websites. Scalefusion’s device management dashboard allows users to manage, monitor remotely, and update all devices from a single interface. Custom roles and permissions can be created to limit the access granted to new admins. Users can create device profiles with customized branding, and a pre-selected list of accessible apps and websites, which can then be applied to individual or multiple devices. Documents and files can be remotely pushed to devices from the dashboard, and the enterprise app store allows users to upload custom app APK files, which are automatically downloaded to devices, with the device user notified to continue installation of the application. Device locations can be tracked, with users able to switch location services on and off from within the dashboard, and any security incidents are recorded, such as attempts to forcefully exit kiosk mode or switch out the device SIM card. Users can also remotely send alarms to make devices ring, send out one-way message broadcasts to any number of registered devices, and remotely wipe all images, videos, and audio files from device galleries. I found Mobilock as I was looking for a MDM solution for my Android tablet deployment. I was looking for a kiosk-type lockdown mode. I got more than that with this software. It did exactly what I needed, including not only the lockdown, but a browser-level whitelist, robust tracking features, and a very intuitive and easy-to-use management software. Being cloud-based, it's convenient even on a mobile platform, and gives you the flexibility to manage your devices from anywhere. I looked for a similar solution for iOS devices (as Mobilock doesn't yet work for iOS devices), and in the process used six different MDM software suites, some from big names in the industry. The Mobilock dashboard was the best out of the bunch. Adding specific-role admins was incredibly easy, and absolutely necessary in my deployment. Even less tech savvy people in my office were able to navigate it easily, and I had the peace of mind knowing they could not alter anything, just look at and do what I wanted them to. As far as support, the Mobilock team has always been right there when I needed support, and have helped me make this the best deployment I can. Very good support system. As much as I love the software, there's one thing that could be made better, and I'm sure will be in time. The Remote Cast feature didn't work well in our deployment, as the devices are field technician devices, and Remote Cast prefers the device to be on a Wi-Fi network. It also doesn't allow remote control, only remote viewing, but that may well be a limitation of the Android OS as opposed to a program flaw. If it would work reliably out in the field, it would be very useful. Of course, it's an optional piece of the software, so that is a minor flaw. Also, in all fairness, it is a beta product, so some bugs and missing features are to be expected. One thing that Mobilock supports that is sorely missing from every MDM solution I've used (even the last one that I purchased, for a great deal more money, for my iOS devices), is real-time updates. In most suites, you have to do a manual update or wait up to 30 minutes (or more) to get new policies and features on your devices. In Mobilock, when you make a change, it's pushed out right away. That's incredibly useful in the field. All in all, this is a feature-rich, easy to use software solution, and the price is absolutely unbeatable. Would recommend to anyone doing mass Android device deployments.-Great price -Easy to use dashboard -Good support -Very simple setup on the device. Once you have your group policies set up, it takes around ten minutes to setup each device. -Locks down the device entirely. In weeks of testing I was never able to break the interface on the device, which is more than I can say for many of its competitors. -File Management allows you to send files and folders to your techs in the field directly, without worrying about email or messaging software. Super handy. -Great price -Easy to use dashboard -Good support -Very simple setup on the device. Once you have your group policies set up, it takes around ten minutes to setup each device. -Locks down the device entirely. In weeks of testing I was never able to break the interface on the device, which is more than I can say for many of its competitors. -File Management allows you to send files and folders to your techs in the field directly, without worrying about email or messaging software. Super handy. -Only on Android devices -Remote cast could work a little better?? -That's really it. Great application with many features to help reduce the movement of employees on the device. Mobilock saving my time, a very good overview of all the devices. Once a live map from Mobilock and functionallity called "BUZZ Device" helped us to find a lost tablet of one of our employees. Also i like fast set up for new devices if someone breaks device or something. The best thing is you can set up whole device from your phone and you can be for example on your holiday trip or somewhere where is internet connection.Simple and fast access via the Internet Dashboard, even from your mobile or tablet. A lot of great features to help control the user of your work equipment. With predefined profiles, you have everything set up very quickly. Our company has its own application that you can upload and send over a few seconds to more than 100 devices. There are also other features such as tracking devices on the map, monitoring mobile data usage, and much more. For a long time, we've been looking for a program that can lock your device so there are applications you want your employee to use and also limit access to the Internet. The price / quality ratio offered by Mobilock is ideal for us. We did not have a bigger problem in 2 years with Mobilock. Support is very helpful and quickly responds to our queries. Simple and fast access via the Internet Dashboard, even from your mobile or tablet. A lot of great features to help control the user of your work equipment. With predefined profiles, you have everything set up very quickly. Our company has its own application that you can upload and send over a few seconds to more than 100 devices. There are also other features such as tracking devices on the map, monitoring mobile data usage, and much more. For a long time, we've been looking for a program that can lock your device so there are applications you want your employee to use and also limit access to the Internet. The price / quality ratio offered by Mobilock is ideal for us. We did not have a bigger problem in 2 years with Mobilock. Support is very helpful and quickly responds to our queries. Mobilock has many good features, not all of them in the original package, but you have to buy them separately. And some updates and enhancements are only focused on devices from LG or Samsung. I would really appreciate from Mobilock in the future to expand their "selected devices" to as many as possible so we could do silent updates on our devices as well. Mobilock is easy to use and understand. Easy to set up. Support is great and very helpful. As the end users have tablets with 4G connection and limited data. I use this to limit the possibility to do other things than absolutely neccesary and part of their daly routine. We have machine for which the users do daily checks and so on. Report error/problem. So one thing is to ensure the tablets will not use up all the monthly amount of data before the end of the month.I like the possibility to create Custom branded device groups with their own device profile. MobiLock gives me full control of the devices and posibility to push new apps to the users, broadcast messages, remote control and publish documents. This gives a very flexible solution. Our company tested some KIOSK apps before we did the obvious choise: MobiLock. Only reason i gave 4/5 for Features & Functionality is, there is always more you can whish for. But All functions in MobiLock are carefully planned to fulfill a certain purpose. There is not an overwelming amount of functions just to show off. Once and a while they publish a new helpful function developing the product. The best of all: I'm on this train already. I like the possibility to create Custom branded device groups with their own device profile. MobiLock gives me full control of the devices and posibility to push new apps to the users, broadcast messages, remote control and publish documents. This gives a very flexible solution. Our company tested some KIOSK apps before we did the obvious choise: MobiLock. Only reason i gave 4/5 for Features & Functionality is, there is always more you can whish for. But All functions in MobiLock are carefully planned to fulfill a certain purpose. There is not an overwelming amount of functions just to show off. Once and a while they publish a new helpful function developing the product. The best of all: I'm on this train already. The one thing i really miss is the possibilty to show/print my payments/receipts/invoices. But again, just ask the support and you will get what you need. I have used this software for the past few years and we use it basically to lock down our tablets to be used for our payroll time clock software. It has worked flawlessly and we have it on over 90 tablets and have never had an issue. I would also like to point out that I have reached out to their customer service department only by email but the response time was excellent and all my problems and issues were addressed in a timely matter. I would not hesitate to purchase from them and would recommend their product to anyone looking for a simple method of locking down their tablet environment both personal and business. We had an issue early on with the software disappearing from the tablet but in all the time we've had it, we only encountered it twice and we believe it may have been a tablet issue and not the software. For the last several versions, we have not had that issue re-occur. Discount available for NGOs and Educational Institutions. Special discount on 1000+ devices deployment. Administrators can remotely push folders and files to registered devices using the device management dashboard. The built-in browser allows users to block access to some websites and whitelist others, as well as hiding the browser address bar. Device profiles can be created with custom branding, pre-selected apps, and whitelisted websites, which can then be applied across multiple devices. Device locations can be tracked, and administrators can remotely switch on and off device location services from the dashboard. Custom applications can be uploaded to the enterprise app store as APK files, and automatically downloaded to registered devices. Device home screens can be customized with the company name and logo, and custom wallpapers. Below are some frequently asked questions for MobiLock Pro. Q. What type of pricing plans does MobiLock Pro offer? Q. Who are the typical users of MobiLock Pro? Q. What languages does MobiLock Pro support? Q. Does MobiLock Pro support mobile devices? Q. Does MobiLock Pro offer an API? Yes, MobiLock Pro has an API available for use. Q. What other apps does MobiLock Pro integrate with? Q. 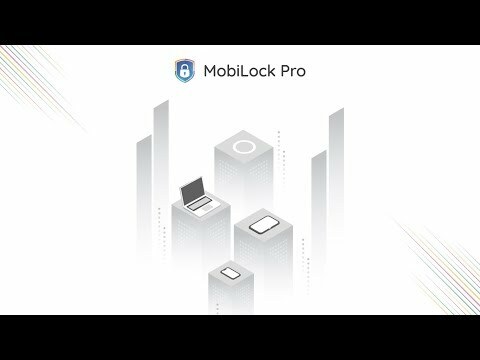 What level of support does MobiLock Pro offer?